Got a friend or family member headed on a long journey this summer? Whether they’re moving to a new city, going away for school, or simply trekking around the globe, give ’em something to remember with one of these travel-inspired gift ideas. Before your pal hits the road – or after they’ve stocked up their luggage with goods from above – avoid airport weight limit overages with this handy dandy pro scale. 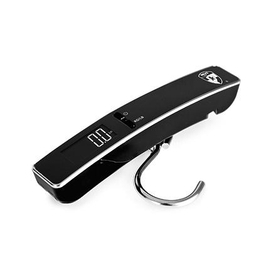 Simply clip it onto your bag, lift, and get an instant reading of what to expect when you’re checking your bags…and lighten your load as needed. Make spotting your bag a cinch at the carousel with these ultra chic, totally adorable luggage tags, available at one of my online shops – Patina. Available in five groovy, homey, retro designs you can pick one to suit your bag, your fave colours, or the destination of your pal – as per the pretty ‘Paris Trip’ design above. Every makeup maven knows a good brush is half the battle to perfecting that face. With that in mind, this set is a SERIOUS steal of a deal – valued at over $120, it’s currently on sale for less than $20. 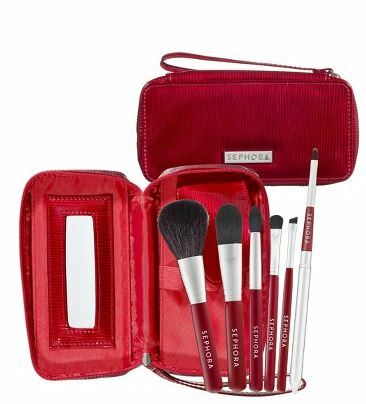 This sleek little red tote includes travel-size versions of a powder, foundation, shadow, crease, liner, and lip brushes in natural and synthetic finishes. Toss in your purse and you’re one set closer to post-plane prettiness! Wow, totally want that travel brush set. So cute and great value! I’m going to check Sephora to see if they have it. If not, I’m getting it online! 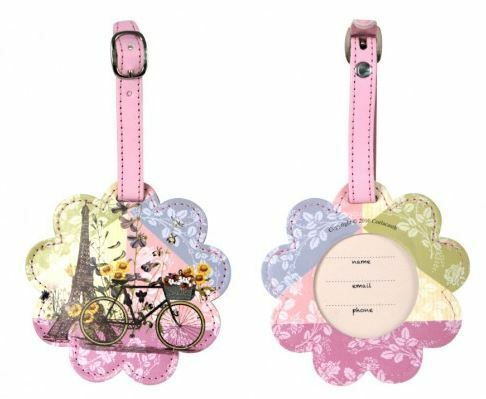 I am putting a Paris package of fun things together for my sister and the Paris luggage tag will be in it.